A specially trained investigative unit, quicker response to calls for help and more comprehensive treatment for victims of child abuse are among the final recommendations issued Friday by a gubernatorial task force on child safety. The Arizona Child Safety Task Force recommended 10 changes to state law, along with dozens of other reforms intended to improve the child-welfare system and prevent further trauma to abused children. Gubernatorial press aide Matthew Benson said his boss had just received the report and had no comment. More to the point, he said Brewer is not going to commit herself now to recommending any of the proposals to the Legislature or even seeking the necessary funding in the budget request she will make to lawmakers in two weeks. Here’s a PDF of the recommendations from the task force: cps_task_force_recommendations. But some say the recommendations fall short by not addressing the root causes of abuse and neglect: gaps in services that prevent parents from getting treatment for substance-abuse and mental-health problems that can lead them to neglect their children, and inadequate training for new caseworkers. Phoenix attorney Jorge Franco, who has won several civil settlements against CPS, said training of CPS employees is key to preventing low-level abuse and neglect reports from turning into child tragedies. It seems to me that in our society’s efforts to reduce and prevent child trauma, we have a huge issue with definition and language. As long as we continue to focus on the traditional definitions of child abuse — emotional, physical, sexual abuse and emotional and physical neglect — we miss grappling with the trauma of family dysfunction that also harms a child’s developing brain. And by using the words “child abuse”, we automatically attach a criminal definition. Now I’m right there with Jorge Franco — we can’t let that first punch even happen. So, would expanding our language from “child abuse” to “child trauma” or “toxic stress”, and expanding our definition to include other things that harm a child help us create a healthier world for children? I’m not sure that “child safety” gets at that. And wouldn’t changing our societal reaction to a child in trouble from one of blame to one of immediate assistance go a lot further to help families reach out when they’re stressed instead of hiding what they’re doing? The way things are set up now is that we wait until parents’ actions escalate to the point of severe harm, and then send in the cavalry, which usually creates more trauma. To me, the immediate reaction when hearing the words “child abuse” is “bad parents”. I think a parent would go a long way into denial, avoidance, justification and covering up to avoid claiming that moniker. So, what are the words to describe a situation in which children are or are likely to be harmed that would prompt this reaction? Would “Stressed parents who need some help or education for a while” work? Currently, and generally speaking, our society’s institutional response to child trauma is to wait until a child has endured a lot of trauma before anyone intervenes. So, not only have we set up our systems so that children aren’t helped until they endure a lot of trauma, we’ve also set our systems to further traumatize and stigmatize parents. That’s society participating in its own form of neglect. And here’s an example of how this might work differently. I lived in Bali, Indonesia for a while. One morning, I awoke in my bed to hear a little boy crying in a house adjacent to the inn in which I was staying. (In this part of Bali, many homes have bamboo walls, which means you can hear everything that goes on in your neighbors’ homes.) The boy’s crying was the fussy cry of an exhausted child, the kind of blubbering that means “I’m tired. I don’t want to get dressed and go to school.” Then I heard his dad, Made, yell at him (pronunciation: Mah-day). That got me to sit up, because it wasn’t too often I’d heard a Balinese father raise his voice to his children. I knew that Made and his family had just returned from visiting California, and, after nearly 24 hours of travel, everyone was suffering from jet-lag. Fuses were obviously short. The child fussed more and louder. Suddenly, I heard “fwwaack, fwwaack”! Made hit his child. Not hard, but it was firm and unexpected, because it set off a different and louder cry: a wail of shock and betrayal, not physical hurt. Made bundled his son off to school. A friend who occupied a room nearby also heard Made hit his son. She and I talked about it at breakfast. Later that day, my friend and I returned from a walk to find Made sitting on a large rock at the entrance to the bungalows. His shoulders drooped. His face was a mask of dejection. He was eating a cucumber. “What did the doctor tell you to do?” my friend asked. Another jaw-dropper. Cucumbers have very very tiny amounts of estrogen, and meat contains small amounts of androgens, but hormone levels in either of those foods are not enough to change behavior. However, living in a culture that frowns upon hitting children, and having a system in place — in this case, parents who are aware they need help and doctors who are trained to help parents…now that’s enough to change behavior. Made wasn’t carted off to jail. Child protective services did not show up on his doorstep. In his world, hitting a child even once means that the adult is out of control and needs to consult someone immediately for assistance. He recognized that a child can’t control his or her behavior when he or she is completely stressed out. But an adult should. That kind of ethic is about as close as a society can get to living a philosophy of trauma prevention. Made and his doctor had a profound effect on me. The lesson was simple: Balinese are Homo sapiens, Americans are Homo sapiens. And if some Balinese had institutionalized a support system to help over-stressed parents, well, then we Americans can, too. OMG – Thank-you, thank-you, thank-you!!! After having my family subjected to the trauma of CPS intervention for almost a year, you have articulated many of my thoughts and feelings about a system bent on blame and punishment rather than real help. The “bad parent” stigma is especially devastating for a parent already diagnosed (not by CPS) with major depression. The most confounding concept for me to grasp is that the system is fraught with policies and procedures that form roadblocks to successful family reunification and yet reunification remains the primary permanency plan for the majority of dependency cases. Please share more!!! Hi, Emily: Since you’re in Arizona, you might want to connect with the Arizona ACE Consortium. 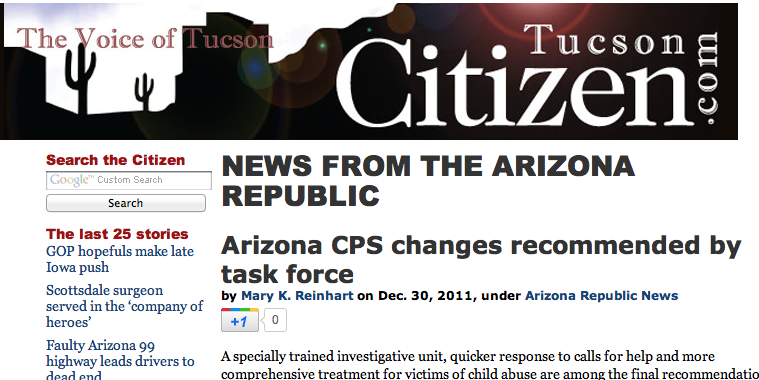 Here’s their web page — http://www.azpbs.org/strongkids/ — you can join the consortium through the site. There are a handful of states — unfortunately, Arizona isn’t one of them so far — that are changing their CPS agencies to being trauma-informed. This Arizona Consortium is working to change a number of local and state policies, as well as doing education about ACEs and trauma-informed care.